Formerly Advocate Health's corporate offices, the single-story, 110,000-square-foot office building started its life as a warehouse. 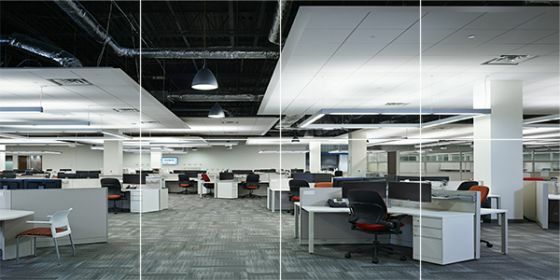 In this project, the building was remodeled to serve other administrative functions when the headquarters was relocated. The building, which serves 600 administrative employees, includes extensive areas of open offices, fully wired meeting rooms and training rooms, new bathrooms, and a large cafeteria. An existing data center remainded in place and fully functional during construction. As a result of a prior HVAC life cycle cost study by G/BA, a number of small, old indoor air-handling units and small rooftop units were replaced with large, self-contained rooftop air conditioning units with variable air volume controls. The long-term plan is to decommission the existing, outdated chiller plant and replace two existing steam boilers with condensing boilers. The mechanical system includes a fully integrated DDC control system. New domestic and fire protection water service was installed to eliminate an exterior underground fire protection loop that was failing. G/BA was tasked with minimizing HVAC equipment noise as much as possible, even in areas with open ceilings. Careful air system design, adquate isolation at the rooftop units, and the use of sound-attenuating materials ensured a quieter workspace. In an added phase, our team designed an expansion to the existing data center’s uninterrupted power supply system, creating a 320 kVA system with 100% backup. The firm also replaced the data center’s cooling system with new computer room air handlers and a modular, 180-ton glycol chiller plant with cold-weather economizer. A concept-level Basis of Design was provided for design/build contractors to bid a three-story addition to an existing two-story parking garage.